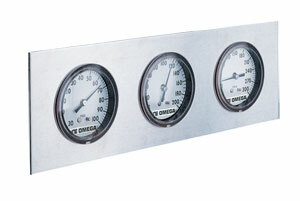 OMEGA™ Panel Gauges utilize a U-clamp mounting design. The attractive black painted steel case gauges are designed for use on instrument panels, air conditioning equipment, air and gas dryers, machine tools, air compressors, pressure test stands, and a wide variety of other panel gauge applications. The movement in the panel gauges is the unique OMEGA Spring Suspended Movement. The entire movement is suspended between two springs, with the Bourdon tube above and the link below. Wearing parts have been reduced to a minimum. Movement parts are ultrasonically cleaned and lubricated with silicone oil to ensure long cycle life. The OMEGA™ spring-suspended movement is resistant to shock, pulsation, and vibration, thus contributing to longer gauge life. OMEGA™ panel gauges, with U-clamp mounting system, are durable and feature long-term life and stability. The attractive black steel-case gauges are designed for use in numerous panel gauge applications. 注: Custom dials available, $125 set-up charge and 100 peice minimum order.